Restop's patented "bag in bag" design and final zipper closure securely contains the waste and the odor, while the special blend of polymers and enzymes instantly begins to break down the waste and convert it into a deodorized gel. The gray liner is designed to be pulled up, over the bucket rim or the seat for extra sanitation, while the foil bag contains the polymers and enzymes to instantly gel and break down the waste. RESTOP’s portable dry toilet system provides outdoor enthusiasts with an environmentally-sensitive way to manage human waste in the outdoors where lavatory facilities are not available. The lightweight, (3 lbs. ), RESTOP Commode sets up in seconds, requires no water and provides a secure, private, outhouse facility when combined with a privacy shelter. 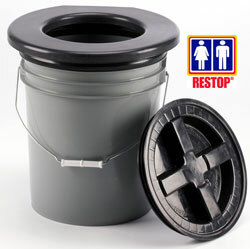 The Restop Commode's waterproof gamma lid meets National Park requirements for contamination prevention while rafting down river. Toilet paper and a moist antiseptic towelette are included with each kit.